Extracted instance of SCP-150 from the brain of D-13732, magnified 20x. Special Containment Procedures: SCP-150 patients kept for study should be contained in Level-3 Biohazard Containment Cells, with no more than 1 instance per cell. Cultures of SCP-150 are contained in vacuum-sealed glass flasks in the Site-42 infectious materials lab. Standard pathogen-handling procedures should be followed at all times. Any instances of SCP-150 found outside of containment are to be incinerated. 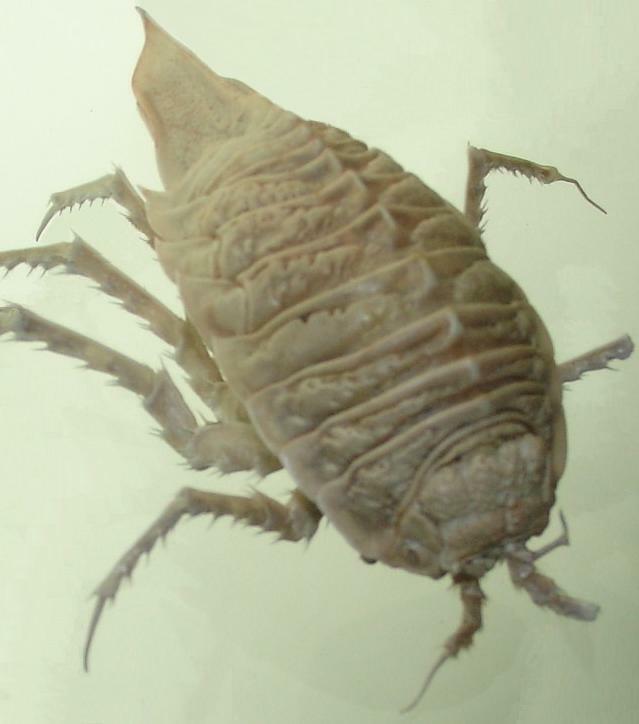 Description: SCP-150 is an obligate parasite that resembles the tongue-eating louse (Cymothoa exigua), but is adapted to form conjunctive symbiotic relationships with humans for a period of its lifespan. Upon contact with a human subject, SCP-150 embeds itself deeply in the flesh of its host. Over the course of approximately seven days, the parasite will burrow into the host and effect numerous physiological alterations. The most glaring alteration is the gradual conversion of the limb nearest the infection site into a chitinous appendage: as SCP-150 consumes the host's flesh, it excretes tissue that replaces and augments the functionality of the host's limb without causing transplant rejection. It is suspected that SCP-150 is able to secrete anesthetic and immunosuppressant substances to prevent the host's body from responding to the change. Furthermore, the nervous tissue excreted by SCP-150 is able to interface with the host's nervous system. By the time the process is complete, the host will be able to control the affected limb with no loss in mobility and often with improved strength, reflexes, and resilience. For a period of one to two weeks, SCP-150 will reproduce, feeding on nutrients from and depositing eggs1 into assimilated blood vessels. The eggs are deposited throughout the human body via the bloodstream - while the vast majority of them die off, enough survive to begin colonizing and altering the rest of the host's body. Though subjects report discomfort and occasional loss of motor control during this process, they often will not recognize the cause of said discomfort. It is still unclear why the offspring do not compete with each other for space or resources, nor how the assimilation process leaves the body's cell signaling mechanisms and processes unaffected. SCP-150 reproduces during this assimilation process: as the lungs are assimilated, more eggs are produced and spread by the patient's coughing. Although as many as 10,000 eggs may be produced during this time, it is estimated that only 1% of them find their way into another host, of which 1% survive the host's immune response and implant successfully. Although SCP-150 inevitably results in the assimilation and alteration of the central nervous system, including the spinal cord and brain, the host's consciousness and behavior are seemingly unaffected. Interviews with subjects infected by SCP-150 have yielded little information, as infected subjects unaware of SCP-150 claim to sense no changes or improvement in certain senses and faculties. While subjects aware of the infection are able to pinpoint the source of the change, they exhibit little to no negative feelings and often express positivity towards it. Two D-Class subjects, D-13732 and D-016002, were infected with SCP-150 and allowed to progress through all stages of the infection. In order to examine the full effect of the infection, exploratory neurosurgeries were performed on both subjects. D-13732 was euthanized; his nervous tissue was found to have been entirely replaced by smaller instances of SCP-150. The instances comprising his brain matter were extracted and stored for experimentation on D-016002. The following decompressive craniotomy and leukotomy were performed by Dr. Harlan Sun, Dr. Wendy Robin, and Dr. Alex Harlow on D-016002. A full transcript follows. Dr. Sun: What is your name? Dr. Sun: Name something to sit in. Dr. Sun: What is the color of grass? Dr. Sun: What is one plus one? Dr. Robin: We have marked off the approximate location of the Wernicke's area2. Dr. Harlow: Thank you, Doctor. Sun, I will now extract some of the specimens from this area. Dr. Sun: Note for the record that D-016002's responses have been slightly slowed. This indicates that the instances within her cranial cavity are indeed acting as neuron analogues, though it is unclear as to how many neurons each instance is equivalent to. Dr. Harlow: I am placing a sample of neural tissue acquired from D-13732 into D-016002 now. The instances from D-13732 have been tagged with a radioactive luminescent dye to distinguish them for extraction later. Dr. Sun: What is ten times eleven? Dr. Sun: D-016002's responses have returned to normal speed. This suggests that it is possible for 150 nervous tissue to be swapped freely between host individuals without rejection. We will now begin the final procedure. D-016002, you will be given a full general anesthetic. Dr. Sun: The patient is now under full anesthesia. Dr. Harlow, you may begin the process of tissue extraction. For this final procedure, we will be attempting to completely replace the brain tissue of D-016002 with that of D-13732. Previously, during the exploration of D-13732's cranial cavity, Dr. Harlow and I observed that the instances connecting his brain matter to his spinal matter were not secured in any way, and in fact seemed to be switching positions with other instances in the brain. We will be seeing how far this compatibility extends. Dr. Sun: Extraction complete. D-016002's brain matter has been successfully removed. Dr. Harlow is now placing D-13732's brain matter into D-016002's exposed cranial cavity. Dr. Robin: Heart rate steady. We have a pulse and breathing. Give it another minute… Alright. I'm going to wake her up. Dr. Harlow: (faintly heard in background) Jesus. Dr. Harlow: Well… that's new. Dr. Sun: Do you feel any pain anywhere in your body? D-016002: My chest is kind of heavy. Feels just the same otherwise. D-016002: Hey, I usually feel pretty energetic, even before surgeries, but I'm kind of tired right now. Lately, I've been exercising before I sleep, but since I can't here, is it okay if I can just rest a little bit? Dr. Harlow: D-016 - ah, D-13732, are you okay? D-016002: Yeah. (yawns) I'm fine, why do you ask? 1. It is hypothesized that SCP-150 can self-fertilize. 2. The part of the brain that controls speech recognition and use.